The dissolution rate of lime in the molten slag is important for the efficient of steelmaking reactions. The dissolution rates of quicklime were conventionally measured by a rotating cylinder method, and they were quite lower compared with the estimated rates from actual steelmaking operations. Previously, the authors reported that the quicklime used in the actual operation had a much faster dissolution rate than completely calcined lime. During the dissolution of quicklime used in the actual operation, quicklime emits CO2 gas twice, and the second gas formation effectively enhances the dissolution rate. Though the dissolution rates of quicklime with a CO2 content of 0, 2, 4, and 9 mass% had been analyzed, the dissolution rates were scattered. The reason for this scattering of the data was that the CO2 content of individual quicklime samples varied significantly within the same grade of quicklime, because the samples used in the previous study were produced by a rotary kiln process. Consequently, the dissolution rates were inconclusive, and the effect of the CO2 content in quicklime on the dissolution rate of quicklime could not be fully clarified. 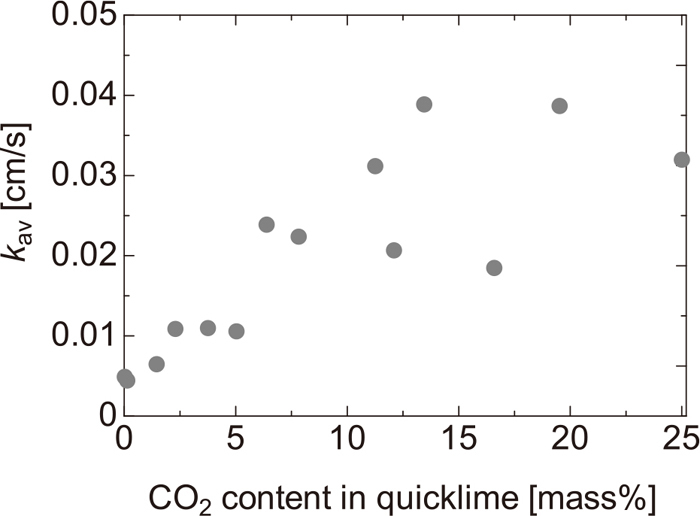 In this study, the CO2 content was controlled through the laboratory-based preparation of spherical quicklime samples and thus, the effect of the CO2 content on the dissolution rate of quicklime in the molten slag could be precisely analyzed. Eventually, this approach allowed to propose the dissolution rate of quicklime with gas formation due to the thermal decomposition of the CaCO3 core existing in the center of quicklime samples.